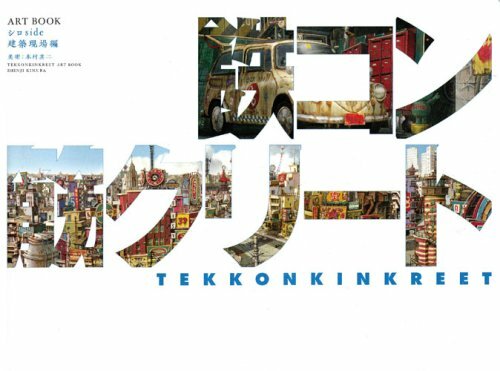 There are two art books for Tekkon Kinkreet, the anime movie. This is one with the white cover, Tekkon Kinkreet Art Book: Background Paintings, or in Japanese 鉄コン筋クリート ART BOOK シロside　建築現場編. The black cover edition is Tekkon Kinkreet Art Book: Background Sketches. The illustrations in the book are grouped into the different areas where the stories take place. There's a map on the contents page highlighting the areas. Straightaway, I'm having that feeling on being a tourist in Japan, that heightened level of awareness all tourists have. Next page, I am floating in the air: it's a two page spread of the cityscape. And that's where the fun begins. The book is filled will illustrations, painstakingly detailed background paintings, from start to end, 255 pages of them out of 260. Sometimes the images are enlarged so you can see the stains and cracks on the bathroom floor, sometimes multiple angles are included to look behind corners of the walls. The number of paintings collected in this book is unbelievable. There's just so much to see, so much to take in. This is a spellbinding book. It's highly recommended to get this together with the other one on background sketches, Tekkon Kinkreet Art Book: Background Sketches. I've been on the fence on getting these two books. I don't know why I'm hesitating, but thanks to your reviews, I can finally purchase them with full confidence. These two Tekkon Kinkreet books are amazing. How much are they in US dollars? I only see the Japanese currency and I don't want to jump in and buy them if they are expensive. Thanks much respect for these reviews! The exchange rate is US$1 to ￥100 currently. The white book is US$38 (￥3,800) and the black is US$24 (￥2,400). The per shipment rate to North America is at US$27 (￥2,700) and per item handling charges at US$3 (￥300). You can check out the shipping rates at this page on amazon.co.jp. They ship by Fedex, which is pretty fast. So the total is about US$95. Ive got this one lately. Its simply fantastic. Both of them. White and black. Real treasure in my collection. Your blogg is Amazing and very very Helpful. I have some of the books you have reviewed. I am also an Illustrator too. I have been after these Books for a very long time, i didn't even know they existed till i went onto you website. I am so greatful, keep up the work! You should be able to get Kinokuniya to order for you. They do have ordering services. But the prices are not going to be too different, at least not that I see from the Kinokuniya in Singapore. Do you know if these works are colored traditionally or digitally? Looks like traditionally painted. Japanese anime backgrounds are usually hand painted, or at least those that I know of are all hand painted. Good to know, thanks Parka. Was this drawn in watercolor? I don't think it's watercolor. Probably poster colour, acrylic or some opaque paint.